In my post “If I Build It” I write about the values-driven entrepreneur as one who is building something based on a set of firmly held beliefs and principles. These values serve as an inner compass and lead them –and anyone bold enough to come along—down the path to purpose. But what, in more certain terms, is a values-driven entrepreneur? What’s different about how they run things and why do I insist that it is this group of people that is going to change the way the world does business? One of my favorite moments in business school was when one of my professors shared Howard Stevenson’s definition of an entrepreneur. It taps into a universal truth that broadens the definition beyond business owner, money-maker, risk junkie, etc. Instead it focuses on the behaviors associated with the entrepreneur, which are infinitely more significant than functions or titles. Thus entrepreneurship manifests itself in a spectrum of industries, environments, structures and organizations. Equally diverse are the types of people who are entrepreneurial. The unifying thread is the pursuit of opportunity despite available resources. 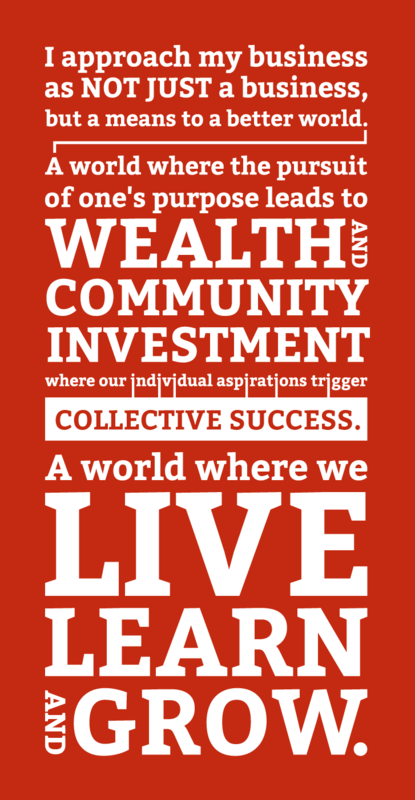 pursues individual purpose to create opportunities and resources for the collective. My definition for values-driven entrepreneur focuses on what compels the pursuit of opportunity. Values, beliefs and principles—about how to lead, about the culture of her company, about the good she wants to do—compel the values-driven entrepreneur. She is driven toward opportunity, not by it. And the sheer act of pursuing purpose opens the door not only for opportunities but for the resources needed to take advantage of them. Purpose. The word itself can be a bit daunting with its connotations of a singular mission or destiny. But I believe our purposes are fluid; they move and evolve with us. And, yes, purpose does have something to do with our reason for being on this earth, but most of us were put here for many, many reasons and will work towards many purposes in our lifetime. The idea of purpose is key not because we have to be directly living out our purpose every moment of our lives, but because a person in flow, immersed in an activity that is directly connected with the individual’s purpose, captivates those around them. Passion + Principles + Purpose -> Resources. This equation describes how people in flow focusing on their purpose become “resource magnets”. I’ve seen this play out too many times for it to be a fluke, and I’ve personally experienced my own moments in this state. As Executive Director of my site, I started off knowing no one and our organization had few connections in the DC market. This meant a bazillion meetings to woo and court potential donors and partners. Meeting after meeting, I would look them in the eye and tell them why I believed in our work and how they could rest assured that their support would allow us to invest in young people who had earned access to opportunity. More often than not, these meetings ended with me walking away with precious resources in the form of time, talent, treasure or some combination thereof. My tour as ED was peppered—as most stints of leadership are—with times of confidence and moments of questioning. There were times I knew exactly what to do and how to do it and times at which I was crossing my fingers and hoping for the best. But the constant through it all was my unyielding belief in what we were doing; I was so passionate about my work that I could not help but share my excitement for it. So my mission going into those meetings was simply to do just that. Not to convince anyone of anything they didn’t want to believe in or move anyone in a way they weren’t willing to. But to speak from where I was and have faith that pursuing that purpose would yield results in the long run. There is a scene in The Matrix where Neo is waiting to see the Oracle and interacts with one of the children in the living room. Spoon boy: Do not try and bend the spoon. That's impossible. Instead... only try to realize the truth. Neo: What truth? Spoon boy: There is no spoon. Neo: There is no spoon? Spoon boy: Then you'll see, that it is not the spoon that bends, it is only yourself. In this scene, Neo learns what his purpose is and what it’s going to take for him to realize this purpose. Spoon boy teaches him that we often learn, and accept without question, what we come to know as “truth.” To try to bend the spoon would be to try to change an external reality that may or may not be there. Accepting that there is no spoon means there is no spoon to bend; the only way to exact any sort of control on the world is to change (bend) himself. Readers of my blog will come to see that I can work a Matrix reference into most contexts, but this is relevant, I swear. Neo’s very existence is for the benefit of the collective. The values driven entrepreneur—like Neo— is not only compelled by her individual purpose, but also equally preoccupied with the desire to ensure those around her benefit from it as well. And one of the most interesting phenomenon in the purpose pursuit is when the entrepreneur (values-driven or otherwise) is no longer consumed with bending the spoon. It occurs when she realizes everything she could possibly need is within and around her. That inner calm and confidence is irresistible to others and acts as a magnet, drawing the resources to the entrepreneur. It is “seeing the Matrix”, and it looks to the rest of the world like the environment is bending toward our will. What we know instead is that we are bending our will to shape our environment. I recently found myself in the presence of a spoon-bender when I met Kristin Groos Richmond, Co-founder and CEO of Revolution Foods. Her company has served over 50 million healthy meals since its founding in 2006. As cheesy as this might sound, being around Kristin is like having sunshine in your pocket. Her countenance draws you in and her energy and passion make you want to stay. I dare anyone to talk to her and walk away not believing, as she does, that healthy eating is a universal right. Kristin’s belief that kids deserve good food might have just as well, and just as admirably, resulted in making healthy meals for her family. But she didn’t stop there; she is propelled by a desire to impact the greater collective and her momentum is contagious. After our meeting, I even found myself trying to figure out how to do similar things for children in my community. This is the kind of power the purpose-driven entrepreneur holds. Kristin’s impact extends beyond the walls of her company because everyone she touches becomes a believer. The power of this multiplier effect is evident; Revolution Foods started out in a rented kitchen and today has over 850 school partners. They are achieving success and broader impact not just because they have their eye on the prize, but because building something—no matter the size-- based on the belief that all kids have a right to nutritious food is the prize. People like Kristin show what’s possible when the world changes the way it does business. She and so many other values-driven entrepreneurs walk the walk of the “Be the change” mantra. There’s another quote from Gandhi that captures the spirit of what I’m driving at. To me, these words serve as a call to action for leaders, entrepreneurs and anyone who believes, as I do, that we hold the power to change how the world does business and businesses hold the power to change the world.